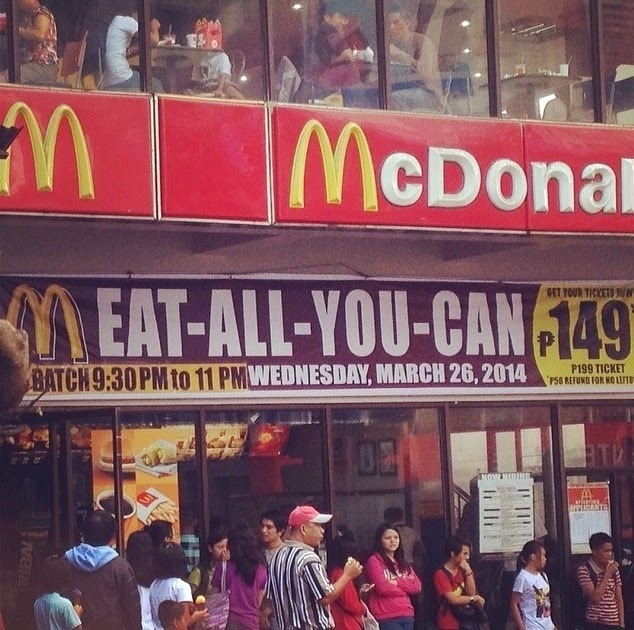 Oh yeah, this McDonald's branch is asking you to eat all you can. Freaking awesome. Among the most common gimmicks that food chains employ to attract customers and attention is by challenging their diners to eat all that they can. And it often works. Take for instance this McDonald's branch who has put up a banner announcing that they will be serving customers everything that their stomachs can handle for a low price of 149 pesos. Ain't that sweet? This photo which is currently generating a chunk of attention online seems to have been taken in Baguio City. The branch in question is the one along Session Road. This isn't the first time that this particular branch has done this type of promotion. They've done it several times in the past. Post by Only In The Philippines.